Note: If using 85% vegan dark chocolate add 2 to 3 tablespoon of grade A maple syrup. 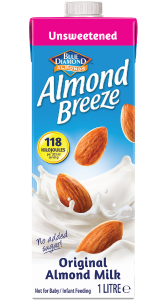 Meanwhile pour the almond milk into a saucepan and spoon in the coconut cream, coconut oil and vanilla extract. Gently warm over a low heat and stir until it has all blended together. Remove from the heat. Then slowly pour the almond milk and coconut cream mix over the grated chocolate and whisk to combine, until all the chocolate has melted*. Then add the maple syrup and mix together. Set to one-side, leave to cool, then cover and place in the fridge to set. This should take 2 hours. 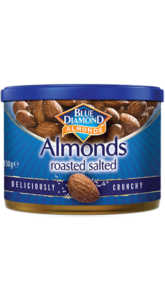 Before removing the chocolate truffle mix from the fridge, take 60 g of Blue Diamond Roasted Salted Almonds and chop them into small pieces, tip these onto a small plate and spread them out. Put out a second plate. * Adding the warm milk to the grated chocolate will prevent the mixture from splitting.